Some of you may snobbishly wrinkle your noses. I hear you say: cheap stuff … can’t really work … proper fountain pens have feeds machined from hard rubber (Ebonite on Wikipedia). Mind you, we are going back a few years when CNC machinery was still in its infancy. Today, everyone has one, just like 3D printers… produce feeds with a 3D printer? Wow! That’s today, the story I am going to tell you unfolded forty years ago. 1. Stay with the tradition of machined rubber parts and focus on the already dwindling upper market segment and surrender the midrange market to whoever took it. The lower segment had already been lost to the Eastern countries. 2. Mount injection moulded plastic feeds in medium market fountain pens with the consequence of reduced performance. If the consumers notice this, permit a possible decline of market appreciation and market share, and eventually, soil the brand name. 3. There was this young ingeneer, who had just started with the company and had no idea about writing instruments. He was confident (based on what?) that he would come up with something to make plastic equivalent to rubber. He wanted a budget and one year. And what if he could not? I had an idea, but it was too early to talk about it, and I also had to learn more about fountain pen functions and inks, and how they were working together. Really, here I was almost at the start of my learning curve, where did the confidence come from? A prerogative of youth? I have written already about ink and surface tension and capillary forces under their particular headings. These topics belong here as well. I decided to write about them first; otherwise, it would have been too much for me to keep it all in my head and organised. A recommendation: If you have not read about the above topics, go and do it, before you continue here. I don’t want to dilute this content through writing about peripheral stuff, again. I had noticed that roughing nibs reduces the surface contact angle, making the solid material appear/behave more hydrophilic, photo 1. In particular, on the underside, where attractiveness is not required, it is most needed. How could this happen? There was no change in material or material characteristics? The material preparation (cleaning) had been the same. Let us look at the contact angle. It describes the angle, which the liquid forms inside itself when it comes in touch with a solid. For the moment you can forget the gas around the couple; it has an effect, too. In drawing 1, you see the liquid forming the angle θ1 (theta) with a flat plane of the solid surface, as expected. 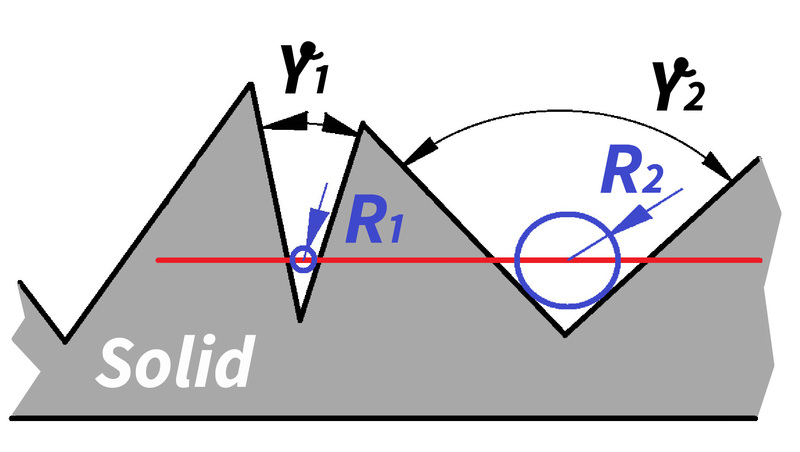 Roughing the surface can be depicted as innumerous, irregular mini-planes next to each other, forming arbitrary angles with each other and the median plane as shown in diagram 2 (red dotted line). The liquid responds to those angled mini-planes, not to the median plane. It does not know of a median plane. The liquid forms the same contact angle θ1 with all the mini-planes around the perimeter of the drop. Looking at it from the drop’s point of view, there are occasions, where the mini-plane rises in regards to the median plane, like on the left side of the drop and others, where the mini-plane falls off like on the right side. On the right side the slope angle tilts away from the drop curvature, angle θ3 is larger. All around the drop, it balances out. It was my observation: “When the roughing was fine enough, then the surface reaction would change from hydrophobic to hydrophilic.” Where the contact angle is smaller, in this micro-area the liquid behaves as if the material is more hydrophilic and the liquid stretches out. The material has not changed, but the liquid had been conned into believing the surface of the solid has changed. Of course, the reverse applies, too, and in some sections, the liquid is confronted with increased resistance to flow. However, the minuscule areas with reduced contact angle cause a strong enough pull on the elastic skin of the liquid and are more significant because eventually the liquid spreads out, encircles those hydrophobic sections and pulls the liquid across them. There is an additional effect. Referring back to the chapter on Capillaries: “… the capillary rise depends on the radius of the capillary.” There, I explained this in diagrams 5 and 6, whereby in squarish capillaries the rise increases in the corners, due to the projected radius reduction. Back to here, drawing 3 shows an application of the above. There are two grooves or scratches with different inclusive angles, γ1 and γ2. At the same level, radii R1 and R2, relevant for the capillary pull, are formed and are different. The capillary pull increases inverse proportionally with the radius. Meaning: with all other parameters the same, but R2 being 4 times R1 the liquid would flow 4 times further in the narrow groove. Have a look in the other chapter on capillaries, I can’t remember it! For the moment, this is all we need to know, principles, not much detail. 1. We have gained knowledge about circumstances, which make a surface behave more water-friendly, hydrophilic, at least in some areas and that’s what counts. 2. Liquid form skins towards gases and solids and their shape and size depend on the surrounding gas, specific gravity of the liquid and its surface tension. 3. As long as there is a sufficient amount of liquid pulled forward, the rest will follow, even over hurdles of hydrophobia. This understanding was my first step towards making a surface behave like a machined rubber surface. The main point I learned was that there is no need to alter the material characteristics, but only its friendliness towards the liquid. Roughing its surface appeared to be the right track. To prove my train of thought, I took a piece of machined rubber and polished it, and made sure that I cleaned off all the polishing compound. Voila! Polished rubber didn’t like ink! Rough it, and we are back to normal. It is the machining, which causes the micro scratches on the surface of the rubber, and they make the rubber hydrophilic. The reason for rubber being used is tradition. In the early production of fountain pens, forerunners of plastics (synthetics) were used, and rubber (Ebonite) was one of the earliest. It could have been any other material, which forms micro scratches when machined. Finding out that polished rubber is hydrophobic proved my theory, but only half. For the other half, I would need to demonstrate that roughing plastics (at least some) would improve their water-friendliness. I used sticks of plastic from leftovers (runner and sprue) of injection moulded components and cut ink capillaries in them. In our current (then) manufacturing process for feeds, the general shape had been injection moulded, but ink capillaries and overflow chambers had been machined into the feed afterwards. Surface action (wettability and contact angle) and capillary rise are proportional. Measuring the rise of ink gave me comparative results, which was enough for deciding on the efficacy of my experiments and provide me with a selection of suitable plastics. Copolymer plastics SAN, ABS and SMA showed results, which were by far superior to mono-polymers. Those waxy ones, PE, AC and PP, did not perform well at all. And that was when luck, Fortuna had lent a helping hand, unbeknown to me, at the time. Initially, I used 400 grit wet and dry polishing cloth and went by looks and feel. At that time I was only investigating the general surface tension behaviour. Later, I used capillaries, sometimes several in the same piece of plastic produced on our standard slit cutting machine in order to standardise the amount of roughing. This method also facilitates cleaning. During one particular test, all the results had noticeably improved. That’s when the ingeneer turns into an investigator. One does not just ignore the facts. The microscope supplied the answer when I sliced the test pieces along the capillary. Along the sidewalls of the groove were distinct circular machining marks. They had been caused by the blade not being correctly aligned with the direction of feeding when machining the test sample. To prove this finding correct, I went back to wet and dry cloth. This time, I did not just rub the sample arbitrarily but rubbed it in one direction, namely, along the axis of a sample stick. I was right. Mainly, on a flat surface, eliminating the effect of gravity, the ink spread along the marks faster and farther. This was good news and helped me in getting a feeling for what was going on in the realms of fluid dynamics. Now, I needed to find a process, which could be applied in a mass-production. Any form of machining, which would require individual component handling, would be too costly. I also needed to remind myself that my job was not to find out fabulous things about plastics and surface finishes, no romantic adventures, but merely to lower production cost of the feed. To cut a long story short, nothing worked. The samples looked almost the same. Why? The microscope revealed it. The grooves, scratches or markings which were in the cavity showed to a much lesser degree on the plastic surface, they were all rounded. The surface tension of the liquid plastics inside the mould was too high to follow the contour of the roughness of the surface of the cavity. Changing the injection process parameters affected results only marginally, within the range of the tolerance of the test equipment. One could see this as a failure, however, when working at the forefront, it is equally vital to know what does not work. It provides more understanding. At this time, I felt stuck. Not nice to be there, but I wasn‘t stuck. Almost ten years working as an ingeneer had provided me with confidence. In all my previous jobs I always had found good solutions. In moments like this, it feels good to know there is something to rely on, even it is nothing concrete. An ingeneer never stops. We get paid for eight hours a day, but most, if not all of the solution finding happens during quiet moments. I was playing with my five-year-old daughter. Someone gave her a plastic toy (I wood not!) and some parts had a metallic finish. Of course, this was not the first time that I had seen metal coated plastics, but this time it triggered something. This time I asked and found my next approach. When nagged by a problem, even subconsciously, the mind must be on special alert. What is the process of getting a metal finish onto plastic? Metals have a higher affinity for water than plastics. What would be wrong with metallising a feed? Metal coating must be cheap; otherwise, they would not coat toys with it. How it is done? There is an excellent article on the net by the AZO Materials company, here is their link. Most metal coated plastic components are made from ABS (Acrylonitrile Butadiene Styrene). It is a versatile material, used in Lego blocks. You know now? It is a copolymer with three components. We used Terluran GP-35 for its high flowability during moulding, at the time manufactured by BASF. I would have liked to tell you what its exact composition was, but after one hour of Internet search, I could not find any information on that. I can tell you from memory, the vinyl component must have been near the high end, 30 – 35%, it was very difficult to break because of its high plastic deformation. I also think that the styrene was near the upper end of 50 – 60%, because it machined well, with the right cutting angle. This leaves 15 – 20% for the butadiene component. The presence of butadiene shows when the break area is whitish. How is it done, roughly? First, the surface of the plastic component is etched in a heated solution, based on chromic acid. In this process the butadiene component is removed from the surface, selectively, providing a micro-etched finish to give bonding to the subsequently applied conductive layer. Once that’s on, through vapour depositing, the electrolytic plating process continues like with any other metal. After a chat with the BASF ingeneers and their: “It should work!” I went to the electroplaters who had been recommended, equipped with a bag of feeds and high hopes. After a 4 hour drive, I arrived there. They gave me a tour of the factory. Smelly, hot, uncomfortable business. I wondered how anyone could work in such an environment. After that, I met the technician. With remarkably raised eyebrows, he first looked at the feeds on the table, long and fixated, and then at me, with a sad look and shaking head, at me. “Can’t be done,” he explained. For depositing, there needs to be an electric potential difference between the cathode and the component surface; otherwise, there is no current flowing, and with no current, there is no transport nor depositing of metal. There would be no way of getting anything into the capillaries. It had been all over and done within two minutes. Or, How long does it take to say the above? Since it was lunchtime and he knew that I had driven for hours to get here, he asked me out for a meal. What conversation does one have with an electroplating expert? The process of electroplating and its difficulties. Electroplating of plastics had still been in its infancy. My question was: “How does one get the metal vapour to adhere to the plastic?” He smiled, it must have been a good question. His sketch on the beer coaster looked similar to this, drawing 5. The small cavities, as seen under an electron microscope… very high magnification. And then the vapour depositing happens. At the time it was copper, now they use mostly nickel. The metal anchors into the plastic surface like press studs, drawing 6. He had several bits and pieces in his pocket. He showed me an etched component and one with deposited copper. The etched part looked greyish like sandblasted. The copper coated one looked just like solid copper, even with patina. You know what came next. An idea exploded: “Could these small cavities have the same effect as the 400 grit polishing cloth?” It looked the same, perhaps, it is the same. I told my technician about my problem. He could see my point. Let’s give it a try. I was very excited and could hardly sleep. Two days later, an express parcel arrived. I dipped a feed in ink, and when I pulled it out, it was covered, saturated with ink, not evenly but everywhere. It worked. After drying in the oven, it had the purple sheen caused by the residue of ink pigment and acetic acid, photo 2. I knocked off early, ready for celebrating, organised the babysitter and took my wife out for dinner. I told her what had happened. I was so excited. She thought I was nuts. Next day I performed a complete feed test, with the feeds in the fountain pens. What a disappointment. The feed functioned only slightly better. Much less than expected, indeed. Oh, life’s roller coaster. I cut an inked feed and etched feed and cut them apart, once along the ink capillary and once through the overflow capillary chamber. It was evident, visible to my naked eyes. The etching acid had barely entered the capillaries, into the overflow for about 1 – 1.5 mm, into the capillary perhaps half a millimetre, drawing 7. The viscosity of the etching solution was too high. My helpful technician must have felt my despair. Subsequently, we/he did some tests, trying to change the viscosity (heat and dilution) and agitating the bath. No success in regards to what I wanted, however, it improved the wettability of the plastic surfaces, which were not machined. The machined surfaces did not need etching as urgently. The manufacturing ingeneers ripped it out of my hand and included it in the production process. Every bit helps. I informed my technician, and I sensed his worries. Now, he had to come up with an idea for passing those tiny pieces of plastic (my feeds) through his treatment process without disturbing the big jobs. While I had been exploring down the etching avenue, I also had been walking down another aisle. One opened up when I remember being at school as a boy when we wrote with dip nibs. When we got a new one, the ink either ran off or pearled in droplets (like mercury) on the metal surface. It did not flow. We took a piece of cloth, or our fingers, dipped it/them in ink and rubbed the nib. 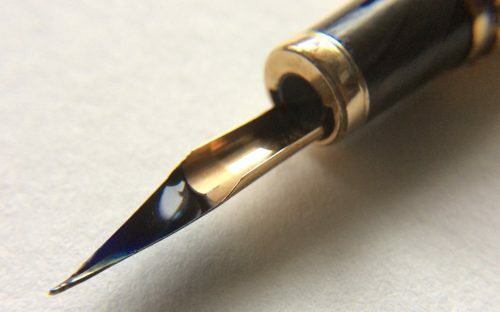 Only after a few rubs, the nib took on the ink. I didn’t know about the acid in ink, but we could indeed smell it. Rubbing ink into the capillaries of a feed? No, but injecting it with a miniature pressure jet? Yes. Afterwards, the feed would be dried, and if needed the jetting could be repeated. A messy business, however, I envisaged having an encapsulated robot to perform this job. Since this was a considerable investment and designing this thing would take some time, I decided to try something else. I built a tank from a 10-litre bucket (with lid), with several jets propelled by a fish tank pump and fins around the side walls. Filled it with ink, it was the most turbulent ink bath. Adding a bit of acetic acid helped. Bathing the feeds in there for several minutes made the ink adhere and forced it to penetrate into the capillaries, to some degree. It increased the performance of feeds of current production. As soon as I introduced this process to manufacturing, a bigger version was built and included in the production process. We called it initialising. Photo 3 shows a feed after initialising after it has been etched. You can appreciate that this process makes the surface more wettable… the contact angle reduces significantly. The bath for production looked much like a washing machine and the dryer like a transfer oven set at low temperature. It had a motor driven belt made from steel mesh and looked like a small pizza oven … what it looks like, today, in 2016. Then, in 1979, pizzas were baked in wood-fired stone ovens with a steel plate. We were just ahead of our time. It’s interesting. Once something works, one doesn’t talk much about it. Life goes on. No resting on the laurels. The focus is always on the remaining challenges or problems. Hardly ever did I feel pushed, it felt exciting, and I was on the hunt. My train of thought was: “Are there any other ways to remove the butadiene?” Butadiene was the obvious target because it formed the largest clusters and it left beautiful cavities. I looked for solvents with lower viscosity. No luck. While this was all going on, I had an opportunity to investigate at the machined surface of a feed made of ABS. What a surprise. It did not seem to be machined at all. I saw steep mountains and narrow ravines, nothing was as smooth as it appeared, but rather like a giant had ripped the material away. The picture (drawing 3) with the narrow angles from further up made real sense, now. I show it here again so that you don’t need to scroll up and also so that I can show it off again. I don’t know when the thought crossed first my mind: “Why focus on the butadiene?” The cavities do not need to be smooth. Any crack would do. Knowing the fact about small angles, cracks are better than smooth cavities. Because of its higher percentage, styrene was my next target. I knew already: Styrene is known for its chemical resistance and acrylonitrile, a vinyl, is pretty tough. I talked with the chemists. They suggested tri-ethylene glycol, abbreviated as TEG. It is a standard product, readily dissolves in water for reducing its potency, but there are issues with being hazardous to humans and the environment. When I queried about this, they suggested to try it, and if it works, then there is polyethylene glycol, PEG, a safe but not as aggressive product. I only did a few tests with TEG, and I knew, I was on a winner. The feed got the greyish, white surface I was looking for, and it absorbed the ink readily. Cutting the feed showed that its low viscosity had allowed TEG to fully enter into the capillaries, all the way down. I tried PEG. The surface did not look as white as after the treatment with TEG. After vigorous initialising, it improved, but not good enough for me. As you know from my photo in the sidebar, I am an old hippie, and therefore, protection of the environment was/is an absolute must. TEG was a no go. I did not talk about this at all, I didn’t want anyone higher up to make a decision over my head. From now on all my testing continued with PEG. Warming up the bath helped, but the stuff evaporated quickly. I put a lid on it, with a cooling coil attached to it. The pump and controller from an old injection moulding tool did just fine. Still, I was not happy. After the initialising, I cut the feeds open and noticed that there were almost circular areas, which had not been etched, drawing 8 . Trapped air-bubbles! They prevented the solution from entering into the capillary. The more vigorous TEG could break the surface tension of the air-bubbles, PEG, not. How could I get rid of the trapped air-bubbles? When I was in a state like this, I liked to wander through the factory. Watching the business in the manufacturing halls somehow calmed my mind. During my apprenticeship, I had mentioned this to my old master. He knew that I was a bit odd and he understood. His advice was: “Always have a bundle of drawings rolled up under your arm and look as if you had a target. In the manufacturing hall for ball pen refills, they used an ultrasonic bath for cleaning the machined ball pen tips. The process was completely enclosed, they used harsh chemicals, they had to get the lubricant for machining out of gaps of about 50 microns wide. On a shelf, I saw a small US bath for testing … I borrowed it. And here we are, almost at the end of this journey. The bath had a heater, which I set to 60° Celsius, which I had found optimal before. The frequencies ranged between 40 and 45 kHz depending on loading. However, the results were not quite there, yet. The etching treatment was inconsistent. Some plastic pieces had been etched more than other… the greyness varied, noticeably. On the positive side, the air-bubbles had reduced in size and number. At a hot chips shop, French fries in the US, pommes frittes in Europe (except the English, they always want to be different) I saw the guy frying the chips in a metal basket, and he moved it up and down. Bingo! The ingeneer never sleeps, never a dull moment. The trigger for the next step. Acoustics had been my chosen speciality subject in the final years of my studies. Here we know, that in an enclosed space, when the air is under the influence of a particular sound frequency (depending on the dimension of the space), then standing wave pattern build up. In this pattern are areas of sound energy accumulation and others where sound waves cancel each other out (to theoretically nothing, but practically only almost). Within the space, the wave pattern remains in a stable position. Therefore, when one moves through this space, one is subjected to varying levels of sound energy intensity. In a kitchenware shop, I found a suitable (thin wire, open mesh) stainless steel strainer and went straight to work. Half an hour later, a motorised rig moved the strainer gently up and down through the US bath with a dozen of feeds in it. It had to be a consistent number since a variation of material in the bath would dampen the wave energy to various degrees. Minimising variable parameters is just so crucial during research. The plastic surface took on the typical grey look, so I knew, it worked, only about ten minutes were enough. Still, I went through the proper test. The feeds were treated in the small initiation bath, dried and cut into pieces. I could see the inside of the capillaries was covered entirely with dried ink pigment. Why and how? The tiny air-bubbles, which had been trapped in the capillaries were subjected to varying sound energy level. Through this, they changed in size and burst. Different bubble sizes need different energy levels. In the next version, the basket did not only move up and down but also rotated around its vertical axis. 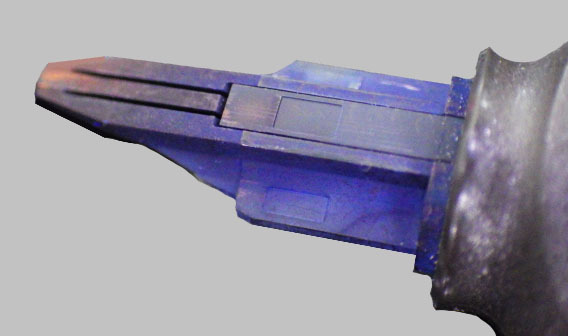 The almost final test had been carried out with standard production feeds inside the grip section, with a nib attached. Production feeds at that time had machined ink capillaries and the overflow chambers. I performed all the tests I had developed to compare the function of fountain pens. All went well. Before committing to the high cost of a production mould, I carried out tests on samples produced in test moulds. For simplicity of the mould, I had separate samples for ink capillaries and overflow chambers. They completed with excellent results. I had proven that the quality of feeds made from injection moulded ABS were equivalent to those from machined rubber. As a matter of fact, the proven fact, they performed better. The result was presented, and management decided to take the risk (what risk?) move over to injection moulded feeds. It was only after that time when I was able to fine-tune the new feed I had developed. Before, the variation in results due to inconsistency in the surface characteristics were too significant. Possible small improvements or display of tendencies had been swallowed by the variation of this parameter. Every now and then, I receive information from the readers of this site, which I read with interest and consideration and if appropriate, add it at the fitting place. This way I found out that it took another 3 years before fountain pens in shops had the injection moulded feeds installed. This was in 1986. Similarly, in 2019, I was informed by the mould designer of Parker at the time that models in 1978 worked with injection moulded feeds. I am grateful that other oldtimers like me love sharing their knowledge. Now, as I am writing this report, in 2016, thirty years later and it appears nothing has changed. After a recent (2018) bitter complaint of a reader, I would like to repeat that the feed appears to be the same. Yes, the shape is still the same but without testing equipment, no one could tell if the feeds still undergo the process that I have described. If not, the results would be inferior by a large degree. Having said this with all due respect, allow me to proudly say: If something has lasted this long and its quality is undisputed, the assumption is permissible that the conclusions drawn in this project were/are within the vicinity of being correct … even there may have been some magic involved. The next chapter is about the concept of Development of the Feed and designing it. I note with interest your comment that it was not until 1986 that fountain pen appeared with injection moulded feeds. I was a tool designer with Parker Pen Co. In my position I designed the injection moulded for their ‘Top line model ‘(1978) ‘Arrow model ‘ (1980) and the feed for their roller ball refills. All were injection moulded. Thanks, Tony for pointing this fact out to me. Insiders such as you help to provide unique information to the fountain pen enthusiasts. I will add it at the appropriate place.